Makeup storage can be tricky. Often, we throw it haphazardly into a drawer where it gets battered and worn, messed up and lost. Imagine if you could have it all organised and beautifully stored so you could find each piece just as you want it. No more rummaging for that lipstick all over your bedroom; it’s right there in front of you. Well, there are some amazing makeup storage solutions around and we’ve pulled together 10 of our favourite to give you the best inspiration for your dressing room or bathroom storage cabinet. No more makeup mayhem – say hello to sophisticated storage. If you’re going to choose makeup storage in drawers as your preferred solution then an organiser with a clear, transparent finish is ideal. It’s the easiest way to ensure your makeup stays organised and the best way to find everything you need quickly. You’ll be able to access individual pieces freely and discover that you use a bigger variety of your makeup than before. The Six-tier Clear Makeup Organiser from Beautify features five drawers plus an upper compartment with hinged flip top lid. Available from Domu. If you have a free corner in your bedroom, then a dressing table is an absolute must. Choose one with thin, narrow drawers in which to store your essential makeup pieces, keeping them close to hand for when you need them most. Sleek, slimline tables look sophisticated and chic in most bedrooms – simply select a style that fits your chosen décor taste, and the hard work is done. This beautiful, elegant dressing table from the French Bedroom Company will especially suit a grand, French bedroom style. We all love a clutter free home, so why not adopt that for your makeup storage? A freestanding makeup storage solution is perfect for those who love to keep their beauty and jewellery accessories all in one place. At first glance it looks like a normal free-standing mirror, but open it up and you reveal shelves and holders designed especially for your makeup. This must be the ultimate in beauty storage, and it will make a lovely addition to any organised bedroom. Love this? Check out our other jewellery storage ideas. The LED standing mirror cabinet from Beautify is available from Domu and is made from a high quality white painted MDF with black velvet interior lining. Dressing tables are beautiful and make the morning routine so enjoyable, but when you don’t have a lot of space and the table needs to be compact, you won’t want it cluttered. Purpose-made dressing tables with in-built storage are thoughtfully designed and allow you easy access to your beauty cabinet while hiding it out of view. The Stiletto Mirror Dressing Table from My Furniture has a sleek, contemporary design and features a lift up section complete with vanity mirror. If you want your makeup storage to coordinate effortlessly with your bedroom décor, choose storage pieces that fit the bedroom design. An accent colour or a metallic shade will help create a cohesive look for a styled beauty area. When you want your beauty products on show, make a feature of them by using storage jars. Olivia, Blogger at Lust Living, has created a beautiful setup for her makeup. The gold theme adds glamour to the design scheme. The chair is from Calligaris, makeup storage boxes can be found at Hubsch. Even if you don’t want most of your makeup out on display, it’s always handy to have your makeup brushes easily accessible. 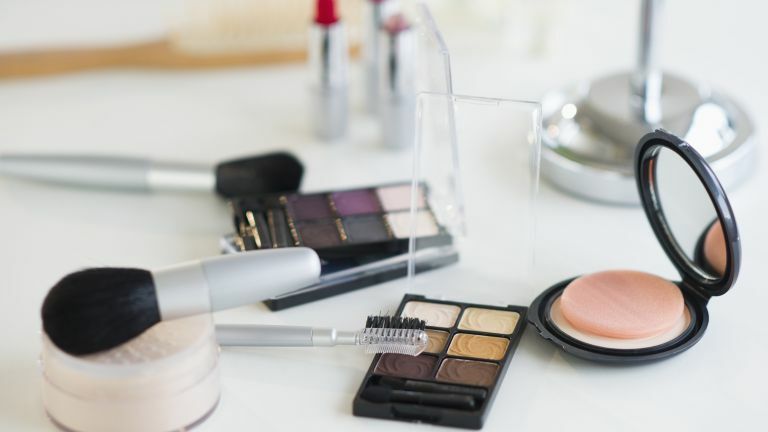 Firstly, it keeps them neat and tidy, and secondly, you’ll find your morning routine so much easier if you’re not rummaging through drawers for your favourite blusher brush. Use an old candle pot or invest in something specifically designed to do the job. This smooth White Marble Brush Holder from Oliver Bonas will add a luxe finish to your dressing table, and the gold detailing is bang on trend. As well as looking great, your makeup storage has to be functional and compact, particularly when it form part of your bathroom storage. If you don’t want to go rummaging in drawers, your essential pieces will need to be kept out on display. Lipstick in lidded boxes, brushes in the right pots. Keep it all easily accessible, and your morning routine will be quicker. Victoria, from the blog Apartment No.4 has created a stunningy beauty station combing gold accents and streamlined styling. Brush pot from a selection at HomeSense. If you’re looking for more quirky makeup storage, then choosing a mirror and shelf all in one could be what you need. Keep a few essentials for when you need them – perhaps a lipstick and fresh powder – next to the mirror for a quick getaway. Ideal for the hallway or smaller bathroom where you don’t need or have space for the full selection of products. The Kandy Wall Shelf from Cuckooland retails for £79 and offers a great way to keep your most used makeup pieces exactly where you need them. Keep your products clean and neatly stored using makeup storage boxes with lids. Acrylic or perspex material helps the visibility of your makeup, so you know exactly where each and every piece is stored. And using a combination of sizes in the same style means being able to keep different items neatly organised and ordered. The Holding Company offer a number of clear plastic makeup storage combinations starting from £14.95. As well as home storage, it’s important to be able to store your makeup and brushes effectively whilst your travelling. Good makeup bags in a selection of sizes help keep your beauty products well ordered, and a good makeup brush holder is essential. Brushes are the first thing to be damaged in your hand luggage or suitcase, so a sturdy yet attractive case is ideal. The Nellie Makeup Brush Set from Oliver Bonas comes in its own handy pink case with metallic embellishments.